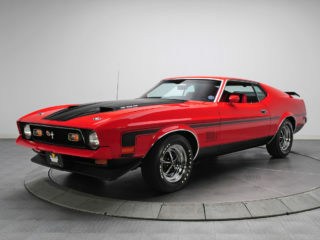 An incredible blend of the finest elements of the custom-coachbuilding and hot-rodding traditions in one stunning package called “Myth,” the car offered here represents a truly unique “what if” scenario and emphatically answers the question. 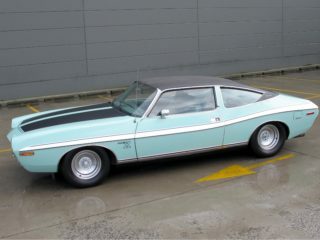 Some years ago, Fran Roxas, the legendary restorer and expert coachbuilder, noted that while the LeBaron-bodied cars represented the ultimate expression of the “Senior” Packards of the Classic Era, particularly the boattail speedsters, phaetons and coupes, a boattail coupe was never offered. 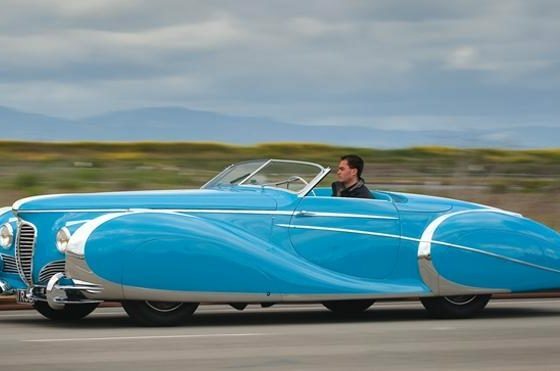 Captivated by the seductive vision of a LeBaron-style Packard boattail coupe many years later, Roxas began quietly planning the epic project that brought “Myth” to its beautifully sculpted reality. In 1996, Roxas engaged Strother MacMinn to create a series of line drawings for the car. MacMinn, a former head of the transportation department at the Art Center College of Design, was uniquely qualified for this assignment. Beginning his automotive career under Franklin Hershey at the Buick studio of GM’s Art & Colour Section in 1936, MacMinn quickly gained fame for his role in GM’s trendsetting Opel Kapitan program during 1938, which remains an advanced and unqualified automotive design benchmark today. Due to Roxas’ workload at his Pebble Beach-winning Vintage Motor Group, the drawings, along with renderings by a student of MacMinn, remained on his desk for a while, but his vision would not be denied for long. Of course, Roxas’ facility already had a number of suitable parts for the project, including a set of 1950s-vintage Kelsey-Hayes wire wheels, as well as a Packard V12 short-block. 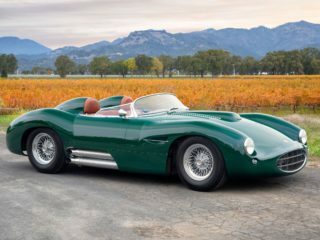 California’s Scott Knight, a highly respected fabricator and coachbuilder in his own right whom Roxas has often collaborated with since the 1970s, revised MacMinn’s drawings and, with his son Dave, began work on the custom chassis and stunning all-steel custom coachwork, completing the job in approximately 18 months. To produce the beautiful bodywork, the Knights utilized groundbreaking computer-based technology, thereby eliminating the need for traditional body bucks. A number of chassis components were fabricated by a shop near Roxas’ Chicago facility, and among them, the suspension components were traditional Packard-type items, with the exception of a subtly dropped tubular front axle and a set of modern four-wheel disc brakes. 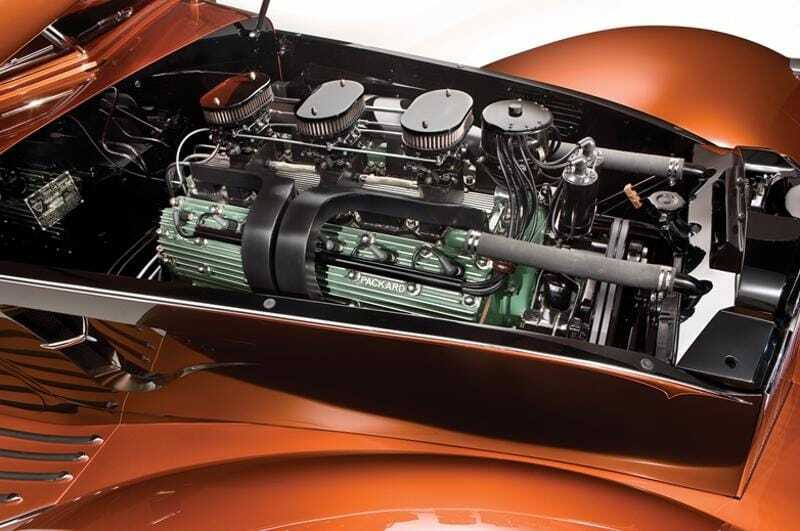 For power, the Packard V12 engine, already displacing a mammoth 445 cubic inches from the factory, was punched out to 500 cubic inches in the finest hot-rod tradition. A custom intake manifold was fabricated, mounting three dual-choke Weber carburetors, along with custom-built exhaust headers feeding the spent exhaust gases into four mufflers. In addition, a pair of finned aluminum high-compression cylinder heads was built especially for “Myth” using an original set of Packard V12 high-compression heads as a pattern. 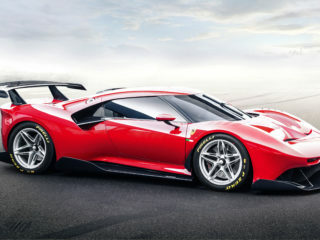 The resulting V12 engine sounds remarkably similar to a Ferrari V12, with a startling exhaust note. It is considerably more powerful than stock and provides an appropriate nod to Enzo Ferrari, who is reported to have long admired the Packard V12 and had used it as a design benchmark for his own legendary V12 engines. The relatively tall Packard V12 engine presented a number of engineering challenges to ensure proper clearance under the low hood. Cleverly, the distributor shaft was shortened to meet this height requirement. Continuing to blend the old with the new, a modern GM 4L60E four-speed automatic overdrive transmission was skillfully mated to the Packard V12, capably handling its strong power output and broad torque curve with a perfect blend of performance, economy and relaxed cruising potential. With its long hood, ultra-low sweeping roofline, teardrop-style fenders, rear fender skirts and boattail rear deck, the coachwork of “Myth” remains true to the more recent drawings and renderings by Strother MacMinn and his student. 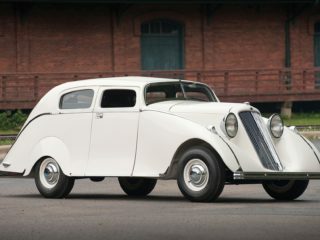 However, its flush modern headlights and tiny taillights, which crown the peaks of the front and rear fenders, as well as the customized bumpers and Packard grille shell, provide a glimpse of what a Senior Packard might have looked like today, had the company survived. The low-cut and split windshield, echoing those used by LeBaron in the 1930s, was custom-built for use on “Myth” and features a neat, Art Deco-inspired spear motif at the center. The stunning exterior finish, comprising 2008 Lexus Tiger Eye Mica and 2005 Bentley Orange Flake Metallic, also provides an appropriate dash of sporting Classic Era-inspired flair. 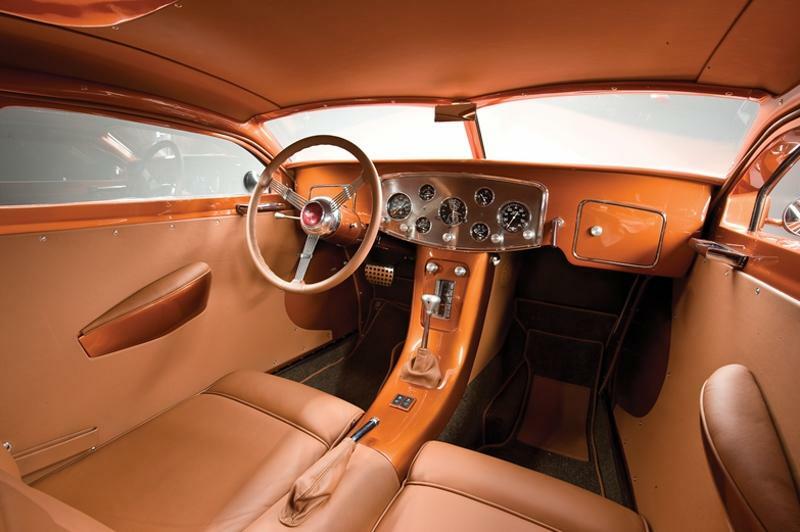 Inside the snug passenger compartment, “Myth” is built and trimmed in a manner akin to a blend of 1930s-vintage closed Bugattis, 1950s GT cars and modern-day ultra-luxury sports cars, with a few Packard components included for good measure. 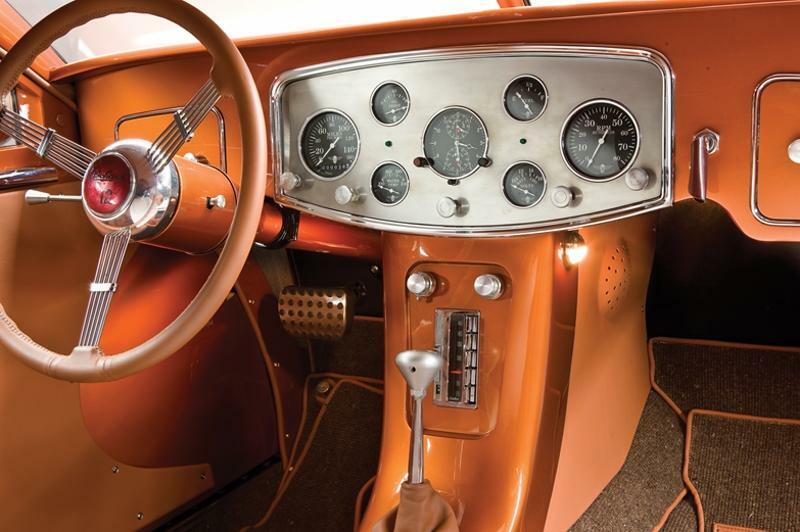 The actual 1934-vintage Packard dash panel has been slightly modified and contains a jewel-like dash insert with a full complement of Stewart-Warner gauges. A leather-wrapped, 15-inch banjo-style Packard steering wheel and a console-mounted floor shifter greet the driver. 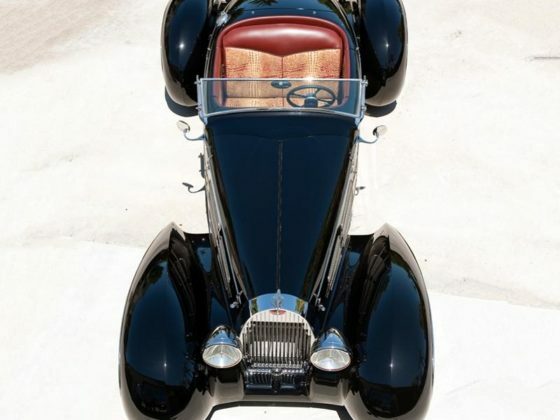 Leather-covered bucket seats, a vertically mounted AM radio, power windows, a Duesenberg-style chronograph and a set of custom-fitted luggage round out the purposeful yet elegant interior. Blessed with drivability and performance capabilities belying its regal proportions and Classic Era design origins, “Myth” stands just 49.5 inches high, weighs a svelte 3,500 pounds and has near-perfect weight distribution. It comes complete with a leather-bound book documenting the four-year build process that was recently completed. A thoroughly integrated and triumphant automotive statement, “Myth” has become reality, and indeed, it continues to be a wonderful testament to its inspired creators.